(ruth again here) How cool would it be to knit up a rocket gansey in honor of my Roketman? What's that nose under the coffee table, you ask? That's Braveheart Rex, in his safe place. 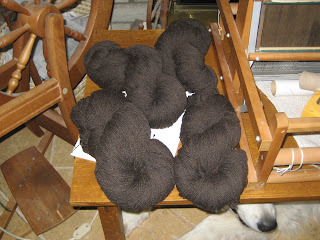 That's 2 1/2 pounds of yarn -- about 2200 yards. From a 5 pound fleece, a black corriedale lamb named Tempest. Wow, I have been rather obsessive-compulsive - I was sampling back on April 29! As for Rex? What can I say- he's the biggest chicken Pyr there ever was. 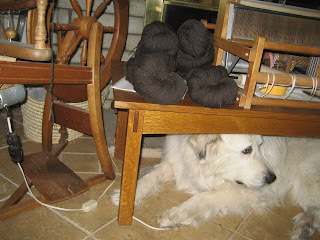 What am I planning for the yarn? It's going to be the road trip project, a gansey for me. Like I mentioned on the research blog, we're going to cruise up in Puget Sound. We're chartering a boat (think Winnebago, not yacht!) and the Roketman's taking instruction for his pilot/captain's license. What other knitting am I taking? I'm taking the navy cashmere that Erin brought me from Stitches West, for the Roketman, and enough sock yarn for about 4 pairs. Summer of Socks starts on Thursday June 21, about 4 days of vacation left. Do I really think I'm going to do a pair a day? No, I realize that's not going to happen, I'm not that delusional. Not for long, any way. but first, a bit of preliminary explanation. You can have a Google "My Page" - which pretty much means you can add little applets (mini-applications) that do the things you need most often. I've got a dictionary (so I can look up spelling), weather for Anacortes Washington because that's where we're going on vacation, the "Unofficial Calvin and Hobbes Cartoon of the Day", Google Maps, a zip code converter, a currency converter -- that kind of stuff. There are pages and pages of applets to choose from. Wow. Too cool - there's Wendy Knits, the Knitting Curmudgeon, the Yarn Harlot... and something called Knitting News Cast at http://www.knittingnewscast.com/news/ . Interesting concept - kinda blog like, but the misspelling of newscast makes me wince instead of thinking it's clever word play.